Like the NFL’s grand spectacle, the Super Bowl, is played every February, thoroughbred racing’s spring jewel, the Kentucky Derby is run every first Saturday in May, and has been since 1875. 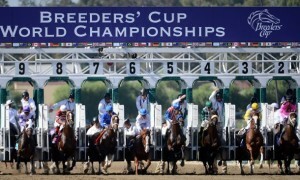 The Derby is the first Jewel in horse racing’s toughest test for three year old horses, the Triple Crown (the Preakness, and the Belmont being the other two legs). 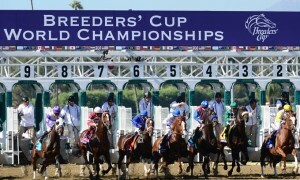 Horse racing’s Triple Crown is one of the hardest feats to accomplish in all of sports as horses have to run at three different tracks, and at three different distances within 5 weeks. No horse has done it since Affirmed in 1978. That being said, the Kentucky Derby is quite an event in itself. Here in Kentucky , where I live, the city of Louisville parties for a couple of weeks, especially Derby week, all for the Greatest Two Minutes in sports. Derby Day is fantastic. You get to see the ladies with their Derby hats, and get to drink Mint Juleps, and the jockeys in their silks, and the stars of the show, the horses. The Derby is kind of like the Super Bowl. NFL fans talk about NFL Quarterbacks and Super Bowls and such when they talk about who is better than whom. Well, the debate over who is the best horse ever is a little different, there are some similarities. I mean, as most people know, there are the great QBs like Dan Marino, Warren Moon, Jim Kelly who either have 1) played in a Super Bowl , but never won it, or 2) never played in one. You have the great ones that have won one or more Super Bowls like Tom Brady, Peyton. Manning, Joe Montana, John Elway. You also have the pedestrian to pretty good but not in the great category of QBs that got rings like Mark Rypian, Doug Williams, and Trent Dilfer. The Kentucky Derby likewise has the same issues. There were great horses like Native Dancer who lost the Derby by a nose, and it was the only race he lost in a 22 race career. Man O’War didn’t run in the Derby because Sam Riddle, the horse’s owner thought the race was too early. The great Forego finished fourth in the 1973 Derby to a chestnut horse named Secretariat. Those are examples of top horses who lost the Derby. On the flipside, you had brilliant horses that did win the race such as Seattle Slew (1977 Triple Crown Winner), Affirmed, and Alysheba. Of course, you had the ordinary ones cross the wire first, and wear the famed Blanket of Roses such as Sea Hero, Lil E Tee, and more recently, Super Saver, and Mine that Bird. Throughout the years, fans develop favorite Derby winners as I have mentioned in a previous blog. I have several favorites such as Alysheba (1987), Silver Charm (1997), Grindstone (1996), Seattle Slew (1977), and a couple of others. However, it was this beautiful chestnut colt whose dazzling performance in his final prep race, the 1991 Blue Grass Stakes run here at Keeneland in April of that year in Lexington, KY that caught my eye. His name was Strike the Gold. When I found out on the ABC Telecast that his sire was my beloved Alydar (see my previous blog about Alydar) who had died about 5 months earlier in November, 1990, I was sold. I had heard about the favorite, Fly So Free (who was also in that race), and another horse named Hansel, and this horse from the West Coast named Dinard. However, Strike the Gold was it. He was also a dead ringer for his sire. Looked just like him. Anyway, he won the Bluegrass, and went on to Churchill Downs on May 4th, 1991 , and won the Derby. Sadly, on December 13, 2011, Strike the Gold. while standing stud at the Karacabey Stud Farm in Turkey, evidently had a heart attack, and was revived by the Stud’s vet only for the staff to discover he had broken his left front pastern. He was euthanized at the age of 23. According to farm officials, he had issues with laminitis, but otherwise, he was doing well, and was a happy horse. He was the oldest living Derby winner. Upon his death, 1993 Kentucky Derby winner, Sea Hero becomes the oldest Derby winner. Strike the Gold was the Turkey Jockey Club’s top Stallion. Sibrili was his top runner in Europe. Strike the Gold was foaled (born) at the famed Calumet Farm in Lexington, KY in February, 1988. His sire was the aforementioned Alydar, and his dam was Majestic Gold by Hatchet Man (dam-sire). Per a Sports Illustrated article about Strike the Gold after his Derby win, he was born a “dummy foal.” To explain this in layman’s terms, he basically had difficulty feeding from his mother. He had to be fed manually. Four months later, he became an orphan when his mother died, and was put with another mare. The farm was in a huge financial mess, and the farm needed to sell off some assets. A man named Giles Brophy was looking to buy a horse, and spotted Strike the Gold running in the field, but Calumet told him he had to buy several of them if he wanted the chestnut. Brophy got into a partnership with Joseph Cornacchia, and William Condren, and bought the horses, and trainer Nicholas P. Zito would be the trainer. Strike the Gold broke his maiden as a two year old on November 15, 1990, the same day his sire, the great Alydar died at Calumet Farm. As a three year old, Strike The Gold entered the Kentucky Derby picture by finishing a stirring second in the Florida Derby to the prohibitive Derby favorite , Fly So Free who was crowned Champion 2 Year Old by the Eclipse Award voters. The highly regarded Hansel, finished third in the race. Strike The Gold’s running style was to drop way back off the pace a la Silky Sullivan (he ran in the 50s, and would come back from 40 plus lengths out to make his run), and make a heart stopping run. Two weeks later, with a new rider, the ill fated Chris Antley (see my blog reviewing “Charismatic” for more on Mr. Antley), Strike the Gold, and Fly So Free met up again, but this time, Strike The Gold who did not drop back as far as he did in the Florida Derby, but Nick Zito didn’t change his running style either, made a great move on the far outside, and blew the doors off of Fly So Free, and won by three lengths. Alydar, Strike The Gold’s sire, won the Blue Grass Stakes in 1978 by 13. The highly regarded Hansel won the Lexington Stakes, and a horse named Dinard won the Santa Anita Derby in early April, and was made the favorite as Fly So Free suffered the loss in the Blue Grass. As most fans of human athletes know, injuries happen, and the players or even wrestlers won’t be able to play from time to time. Injuries happen to horses as well, and the health of the horse comes first. Dinard, the Santa Anita Derby winner, and the Wood Memorial winner Cahill Road (full brother to 1990 winner Unbridled) were withdrawn due to injuries. The horse that became the favorite was Hansel. Fly So Free’s loss in the Blue Grass was held against him, and Strike the Gold had a Dosage Index around 9. The Dosage Index is some sort of number to indicate a horse’s ability at a distance, and the one thing that hurt Strike the Gold was that at the time (may have been adjusted by now) his D.I was 9.00 , which would make him a sprinter or something. Anyway, on May 4, 1991, at about 5:40pm or so, the 16 horses loaded, and Strike the Gold had the #4 saddle cloth number, but his post was #5. When the gates opened, he saved ground into the first turn. Going around the turn, Antley got him into about 12th. I remember watching that at my home in NJ at the time. I was thinking, “Man, he is way back there.” Well, as the horses were going down the backside, and approaching the far turn, I could see Strike the God with his distinctive shadow roll, and the pink silks just coming hard on the outside like a freight train. At the top of the stretch, I could see him coming down the stretch, and when he got past that 1/8th pole , and grabbed the lead, I totally lost it. My chihuahua, Benji that I had even went crazy seeing me jump up up and down. When Strike the Gold crossed the line first, I was crying, and was so proud of him. Strike The Gold’s connections, owners Cornacchia, Brophy, and Condren were going nuts in the stands as was Nick Zito who when interviewed was totally hoarse. Who could blame him? Even though Zito had a good horse named Thirty Six Red who ran second in the Belmont Stakes, and third in the Breeder’s Cup Classic the previous year, it was Strike The Gold that made Zito a household name. The three owners were bickering amongst themselves. The problems and the 1991 Derby winner’s losing streak continued into his four year old year in 1992. The partnership between the three men was dissolved, and Strike The Gold was sold at auction, the second Kentucky Derby winner ever to be sold after winning the race. He brought 2.9 million dollars, and Condren and Cornnachia were the winners. They basically bought the horse from Brophy who evidently started taking all the credit for the horse’s Derby success causing a lot of the friction. Zito was kept as trainer, and Craig Perret was named as the horse’s new rider. A couple of days later in May of 1992, Strike the Gold entered the Pimlico Special which featured top horses such as Best Pal, Flight So Free, and Twilight Agenda. He dropped back as usual, and then made his usual run, and ran down Fly So Free, and won after a 12 race losing streak.He then went on to win the Nassau County Handicap at Belmont in June, 1992, but unfortunately did not win another race that year, even though he did finish 2nd in the Suburban Handicap, and the Jockey Club Gold Cup. He eventually retired in June, 1993 as a five year old after a third place finish in the Nassau County Handicap. Before he came back to race that year, he battled an intestinal related illness, but recovered well. He won an allowance race upon his return, but finished sixth in the Pimlico Special. After the Nassau County Handicap, Zito said he had some “heat” in his ankles, and a strained suspensory ligament. Strike The Gold started his stud duty at the Vinery in Midway, KY in 1994, and he was sold to the Turkish Jockey Club in 1998 to stand at their Karacabey Stud where as I said, he died. I have had the pleasure of visiting Strike The Gold several times at the Vinery. He will always be my all time favorite Derby winner. Yeah, his being sired by Alydar has a lot to do with it, as the fact that he was a dead ringer for his sire was a factor. However, it was the story of his life as I have just recounted that attracts me. He overcame quite a bit. He was a pretty popular horse when he ran. Fans loved him when he ran, and fans loved him after he retired as well. Famed horse retirement farm, Old Friends , just several months after it first got started in 2002, sold 50 dollar “shares” in the horse while he was in Turkey in hopes of raising money to bring Strike The Gold back to Kentucky after he was pensioned (retired from being a sire), and was no longer a sire, as Turkey is one of those countries that sells horse meat, etc. Unfortunately, Strike the Gold won’t make it back home to Kentucky where he was born and raised after all which is very sad. I have several mementos pertaining to the 1988 Kentucky Derby or Derby 117. I have cups , glasses, and photos with Strike the Gold. On one visit, the guy from the Vinery office had to show him as none of the workers were around. We both went into the horse’s stall. It was so awesome. There I was in Strike The Gold’s stall. He was a little pesky, but it was fun. Got to take photos, and pet him. One other time, and this is one of my favorite things, one of the handlers gave me a lock of the horse’s tail. It was so cool. I really appreciate it now. I have plenty of great memories of Strike the Gold. However, the best one is when I was reading on Thoroughbred Times on their site that Strike The Gold was going to Turkey, and I had found out he was leaving that Friday. I got to visit him Thursday, the day before he left. I got to give him peppermints and take a photo with him. It was a great experience that I will always remember. It was the last time I ever saw him. I hoped that Old Friends would get him back, but it was not to be. One time, I wrote to the Turkish Jockey Club to see how he was, and they were nice enough to send me photos. No matter whether Strike the Gold (record 31 starts: 6 wins 8 seconds 5 thirds with total earnings of $3,457,026.) won or lost, he always made the races he ran in exciting. He finished in the money 19 times, and when you saw him coming, your heart just beat so fast. I was always so excited when he was in the field because he was such a threat to make one of his stirring come from behind performances. When he ran down the tiring speed horses and go right by them, it was just SICK (meaning really intense). It really was thrilling to watch him race. That being said, the real sad aspect about Strike The Gold’s passing is that when one thinks of his stirring performance in the 1991 Kentucky Derby is that with the exception of Nick Zito, everyone connected with the feat is now dead. Giles Brophy died of leukemia in April of 2006. William Condren died in November of 2007, and Joseph Cornacchia died in June of this year. The real tragedy is that his Derby jockey, Chris Antley after a brief comeback in 1999 when he had his Derby/Preakness triumph aboard Charismatic (see my review of the ESPN Films 30 on 30 about Charismatic), died of an apparent overdose on Dec 2, 2000. Nick Zito is the only one left. I have met Mr. Zito a few times at horse sales, but the one time I got to chat in depth with him was at Old Friends’ grand opening and first fundraiser. I told him about my Derby 117 collection and how much I liked Strike The Gold. He appreciated that I was a huge fan. In conclusion, it is tough to hear about the passing of such a magnificant horse. It is harder when it is your favorite. However, it is comforting to know Strike The Gold was a “happy horse” according to the Turkey Jockey Club officials, and he is no longer suffering. He gave racing fans a lot of memories and thrills that will continue to live on through our hearts, and will not be forgotten. Nick Zito is the gray haired guy pointing with both fingers up in the air. Zito is the gray haired guy with the blue suit . Near end of vid, he is walking away.